IWC is launching this unique set as a small and large taster ahead of the sensational novelties coming from IWC to mark its 140th anniversary. 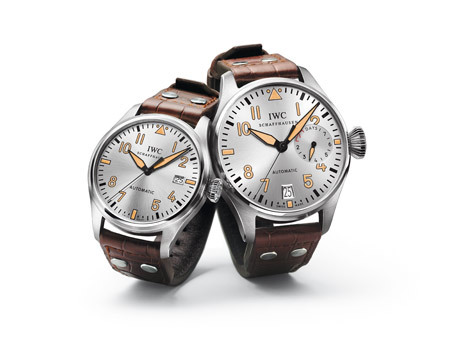 Two IWC pilot’s watches for the best partners in the world: father and son. In a form of lifetime male bonding, they share the major and minor exploits of their common adventures. Like a pilot and co-pilot, they work well together as an experienced team, and these two watches, which give outward expression to this sense of belonging together, unite them as a token of their friendship. They have the same taste in traditional men’s toys. And when the pair go side-by-side through thick and thin, you can rest assured that they are a strong team – father and son, indeed. It is a kind of secret society like no other. With its pilot’s watches for father and son, IWC is making a veritable partnership-based offer for father-and-son relationships: the Big Pilot’s Watch in platinum for the father, and its somewhat smaller counterpart in stainless steel for the son. Almost every father has great plans for his son, and our identification with our father leaves an impression over an entire lifetime. Whoever consciously fosters this valuable and intimate bond sends a clear signal with this pair of watches. 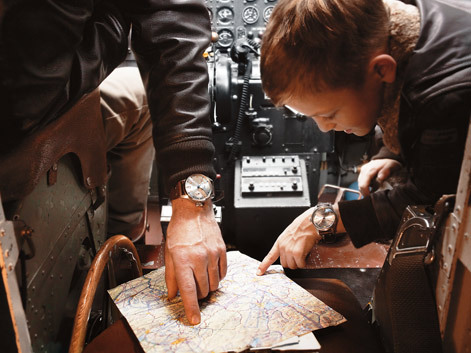 Pilot’s watches for father and son are like a guide to masculinity and represent a perfect family unit. This is also true in technical terms, for both timepieces belong to one of the most distinctive watch families from IWC Schaffhausen – and they are tried and tested pilot’s watches through and through. In this particular case, however, they are rather more than that – for they exhibit many resemblances. Like father and son. Both have the same rhodium-plated, light-coloured dial of the pilot’s watches, the same user-friendly onion-shaped crown of the early pilot’s watches from IWC, and the same black crocodile leather strap and characteristic steel rivets. Wear it and stand out from the crowd. Individually and even more so together. The only difference between the two watches is their size – like father and son. This ideal combination, which was designed specifically for this purpose – and for this purpose alone – is available not only as pilot’s watches for father and son, but also as pilot’s watches for father and sons in the context of a large family to ensure that fairness prevails and domestic harmony is maintained. For those with a technical interest, ensconced behind the model for the father in its 46.23 15.8 mm platinum case is the Ref. 5004, the Big Pilot’s Watch with the 51111 calibre, the renowned long-running mechanical movement with an automatic Pellaton winding system, date and seven-day power reserve that is indicated on the dial. The antireflective sapphire glass is specially secured against displacement by a sudden drop in air pressure. And the watch is water-resistant to 6 bar. The smaller edition for the son largely corresponds in technical terms to the Pilot’s Watch Mark XVI with its 39311.5 mm stainless steel case and the 30110calibre automatic movement. It also has a screw-in onion-shaped crown, an antireflective sapphire glass secured against displacement by a sudden drop in air pressure, Pilot’s watches for father and son Big Pilot’s Watch and Pilot’s Watch Mark XVI a central seconds hand and a date display. This watch also sits comfortably on the wrist on a black, crocodile leather strap and is protected against loss by a strong folding clasp. It, too, is water-resistant to 6 bar. A small but noteworthy detail eliminates undesirable mix-ups, particularly in the case of a crew with several sons: the inner circle on the back of the watch is reserved for an engraved name, which leaves not doubt as to who is ready for take-off. This entry was posted on February 1, 2008 at 8:24 am and is filed under Haute Horlogerie, Mechanical, News, Press releases, Swiss. You can follow any responses to this entry through the RSS 2.0 feed. You can leave a response, or trackback from your own site. We just heard that the watches are not produced in a limited edition version and the set should retail around CHF 55.000,– and in The Netherlands for EUR 39.000,– including 19% VAT. 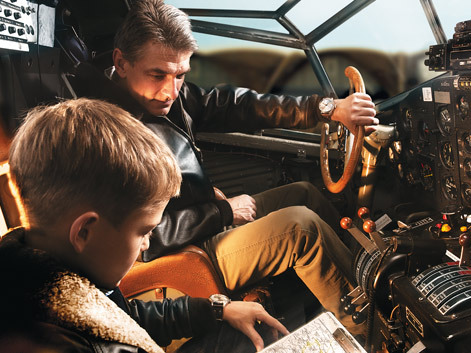 Hm….do you know where I can buy this family set of Big Pilot Watches? my boss wants them and i fail to find them in the russian market…. maybe some on-line shops or direct dealers web-sites… thx a lot! @Ksenia: I just sent you an e-mail with addresses of retailers.